Each year, thousands of young children are killed or injured in car crashes. Proper use of car seats helps keep children safe. But with so many different seats on the market, many parents find this overwhelming. If you are expectant parents, give yourselves enough time to learn how to properly install the car seat in your car before your baby is born to ensure a safe ride home from the hospital. The type of seat your child needs depends on several things, including your child's age, size, and developmental needs. Read on for more information from the American Academy of Pediatrics (AAP) about choosing the most appropriate car seat for your child. This chart is a quick guide on where to start your search. It's important to continue your research to learn about each seat you use. ​All infants and toddlers should ride in a rear-facing seat until they reach the highest weight or height allowed by their car seat manufacturer. Most convertible seats have limits that will allow children to ride rear facing for 2 years or more. ​Children who have outgrown the rear-facing weight or height limit for their convertible seat should use a forward-facing seat with a harness for as long as possible, up to the highest weight or height allowed by their car seat manufacturer. Many seats can accommodate children up to 65 pounds or more. Car safety seats may be installed with either the vehicle's seat belt or it's LATCH (lower anchors and tethers for children) system. LATCH is an attachment system for car safety seats. Lower anchors can be used instead of the seat belt to install the seat, and many parents find them easier to use in some cars. The top tether improves safety provided by the seat and is important to use for all forward-facing seats, even those installed using the vehicle seat belt. Although the seat belt and LATCH systems are equally safe, caregivers may prefer one system instead of the other. Keep in mind that only one system should be used unless the car safety seat and vehicle manufacturer say it is OK to use 2 systems at the same time. Vehicles with the LATCH system have lower anchors located in the back seat, where the seat cushions meet. Tether anchors are located behind the seat, either on the panel behind the seat (in sedans) or on the back of the seat, ceiling, or floor (in most minivans, SUVs, hatchbacks, and pickup trucks). All forward-facing car safety seats have tether attachments that fasten to these anchors. Nearly all passenger vehicles and all car safety seats made on or after September 1, 2002, are equipped to use LATCH. See vehicle owner’s manual for highest weight of child allowed to use top tether. All lower anchors are rated for a maximum weight of 65 pounds (total weight includes car safety seat and child). Parents should check the car safety seat manufacturer’s recommendations for maximum weight a child can be to use lower anchors. New car safety seats have the maximum weight printed on their label. NOTE: Seat belts—If you install a car safety seat using your vehicle's seat belt, you must make sure the seat belt locks to help get a tight fi t. In most newer cars, you can lock the seat belt by pulling it all the way out and then allowing it to retract to keep the seat belt tight around the car seat. In addition, many car seats have built-in lock-offs to lock the belt without having to lock the seat belt separately as well. Refer to the vehicle owner's manual for details about how your seat belt locks. Middle of the back seat—The safest place to ride for all children younger than 13 years is the back seat. If possible, it may be best to ride in the middle of the back seat. However, it is sometimes difficult to install a car seat tightly in the middle if the vehicle seat is narrow or uneven. Also, many vehicles do not have lower anchors for the middle seating position. It is safest to put the car seat in a position where you can install it tightly with either the lower anchor system or the seat belt; in some cases, this may be on either side of the back seat rather than the middle. A child passenger safety technician (CPST) can help you decide which place is best to install your child's car seat in your vehicle. The AAP recommends that all infants ride rear-facing starting with their first ride home from the hospital. All infants and toddlers should ride in a rear-facing seat, as long as possible, until they reach the highest weight or height allowed by their car safety seat manufacturer. Most convertible seats have limits that will allow children to ride rear facing for 2 years or more. When infants outgrow their rear-facing–only seat, a convertible seat installed rear facing is needed. All parents can benefit from getting installation help from a CPST to ensure that their seat is properly installed. Three types of rear-facing seats are available: rear-facing–only, convertible, and 3-in-1. When children reach the highest weight or length allowed by the manufacturer of their rear-facing–only seat, they should continue to ride rear-facing in a convertible or 3-in-1 seat. Are used for infants up to 22 to 35 pounds, depending on the model. Are small and have carrying handles. Usually, come with a base that can be left in the car.The seat clicks into and out of the base so you don't have to install it each time you use it. Parents can buy more than one base for additional vehicles. Should be used only for travel (not sleeping, feeding, or any other use outside the vehicle). Can be used rear facing and, later, "converted" to forward facing for older children when they outgrow either the weight limit or the length limit, for rear facing. This means the seat can be used longer by your child. They are bulkier than infant seats, however, and they do not come with carrying handles or separate bases and are designed to stay in the car. Many have higher limits in rear-facing weight (up to 40–50 pounds) and height than rear-facing–only seats, which make them ideal for bigger babies and toddlers. Have a 5-point harness that attaches at the shoulders, at the hips, and between the legs. Can be used rear facing, forward facing, or as a belt-positioning booster. This means the seat may be used longer by your child as your child grows. Are often bigger in size, so it is important to check that they fit in the vehicle while rear facing. Do not have the convenience of a carrying handle or separate base; however, they may have higher limits in rear-facing weight (up to 40–50 pounds) and height than rear-facing–only seats, which make them ideal for bigger babies and toddlers. Always read the vehicle owner's manual and the car seat manual before installing the seat. Place the harnesses in your rear-facing seat in slots that are at or below your baby's shoulders. Ensure that the harness is snug (you cannot pinch any slack between your fingers when testing the harness straps over the child's shoulders) and that the harness chest clip is placed at the center of the chest, even with your child's armpits. Make sure the car seat is installed tightly in the vehicle with either LATCH or a locked seat belt. If you can move the seat at the belt path more than an inch side to side or front to back, it's not tight enough. Never place a rear-facing seat in the front seat of a vehicle that has an active front passenger airbag. If the airbag inflates, it will hit the back of the car seat, right where your child's head is, and could cause serious injury or death. If you are using a convertible or 3-in-1 seat in the rear-facing position, make sure the seat belt or lower anchor webbing is routed through the correct belt path. Check the instructions that came with the car seat to be sure. Make sure the seat is at the correct angle so your child's head does not flop forward. Check the instructions to find out the correct angle for your seat and how to adjust the angle if needed. All rear-facing seats have built-in angle indicators or adjusters. Check the car seat instructions and vehicle owner's manual about whether the car seat may contact the back of the vehicle seat in front of it. Still having trouble? Check with a certified CPST in your area who can help. See the end of this article for information on how to locate a CPST. What if my baby's feet touch the back of the vehicle seat? This is a very common concern of parents, but it should cause them no worry. Children can bend their legs easily and will be comfortable in a rear-facing seat. Injuries to the legs are very rare for children facing the rear. What do I do if my baby slouches down or to the side in the car seat? You can try placing a tightly rolled receiving blanket on both sides of your infant. Many manufacturers allow the use of a tightly rolled small diaper or cloth between the crotch strap and your infant if necessary to prevent slouching. Do not place padding under or behind your infant or use any sort of car seat insert unless it came with the seat or was made by the manufacturer for use with that specific seat. Why should I dress my baby in thinner layers of clothing before strapping him or her into a car seat? Bulky clothing, including winter coats and snowsuits, can compress in a crash and leave the straps too loose to restrain your child, leading to increased risk of injury. Ideally, dress your baby in thinner layers and wrap a coat or blanket around your baby over the buckled harness straps if needed. See Winter Car Seat Safety Tips from the AAP. Do preemies need a special car seat? A car seat should be approved for a baby's weight. Very small babies who can sit safely in a semi-reclined position usually fit better in rear-facing–only seats. Preterm infants should be tested while still in the hospital to make sure they can sit safely in a semi-reclined position. Babies who need to lie flat during travel should ride in a car bed that meets Federal Motor Vehicle Safety Standard 213. They should be tested while in the hospital to make sure they can lie safely in the car bed. Always read the vehicle owner's manual and the car seat manual before installing the seat. Any child who has outgrown the rear-facing weight or height limit for her convertible seat should use a forward-facing seat with a harness for as long as possible, up to the highest weight or height allowed by her car seat manufacturer. It is best for children to ride in a seat with a harness as long as possible, at least to 4 years of age. If your child outgrows a seat before reaching 4 years of age, consider using a seat with a harness approved for higher weights and heights. Convertible seats: Seats can convert from rear-facing to forward-facing. These include 3-in-1 seats. Combination seats with harness: Seats can be used forward facing with a harness for children who weigh up to 40 to 90 pounds (depending on the model) or without the harness as a booster (up to 80–120 pounds, depending on the model). Built-in seats: Some vehicles come with built-in forward-facing seats. Weight and height limits vary. Do not use built-in seats until your child has reached the highest weight or height allowed for your rear-facing convertible car seat. Read your vehicle owner's manual for details about how to use these seats. Travel vests: Vests can be worn by children between 20 pounds and 168 pounds and can be an option to traditional forward-facing seats. They are useful for when a vehicle has lap-only seat belts in the rear, for children with certain special needs, or for children whose weight has exceeded that allowed by car seats. These vests usually require use of a top tether. Always read the vehicle owner's manual and the car seat manual before installing the seat. It is important that the car seat is installed tightly in the vehicle and that the harness fits your child snugly. Move the shoulder straps to the slots or harness position that is at or just above your child's shoulders. Check the instructions that came with the seat to be sure you are positioning the shoulder straps correctly. You may have to adjust the recline angle of the seat so that it sits more upright in your vehicle. Check the instructions to be sure. If using a seat belt, make sure it runs through the forward-facing belt path (be sure to follow car safety seat instructions) and that the seat belt is locked and tightened. If using the lower anchors, make sure that the weight of your child plus the weight of the seat does not exceed 65 pounds. Most seats now state the maximum child weight to use the anchors in the manual and on the stickers on the side. If the child weighs too much, families must use the seat belt to install. Always use the top tether when you can. A tether is a strap that is attached to the top part of a car safety seat and holds the seat tightly by connecting to an anchor point in your vehicle (often on the seat back or rear shelf; see your vehicle owner's manual to find where tether anchors are in your vehicle). Tethers give important extra protection by keeping the car safety seat and your child's head from moving too far forward in a crash or sudden stop. All new cars, minivans, and light trucks are required to have tether anchors as of September 2000. Forward-facing seats come with tether straps. A tether should always be used as long as your child has not reached the top weight limit for the tether anchor. Check the car safety seat instructions and vehicle owner's manual for information about the top weight limit and locations of tether anchors. What if I drive more children than can be buckled safely in the back seat? It's best to avoid this, especially if your vehicle has airbags in the front seat. All children younger than 13 years should ride in the back seat. If absolutely necessary, a child in a forward-facing seat with a harness may be the best choice to ride in front. Just be sure the vehicle seat is moved as far back away from the dashboard (and airbag) as possible. His shoulders are above the top harness slots. The tops of his ears have reached the top of the seat. High-back and backless are 2 standard types of booster seats. They do not come with harness straps but are used with lap and shoulder seat belts in your vehicle, the same way an adult rides. They are designed to raise a child up so that lap and shoulder seat belts fit properly over the strongest parts of the child's body. When using a booster seat, always read the vehicle owner's manual and the car seat manual before installing the seat. Booster seats often have a plastic clip or guide to correctly position vehicle lap and shoulder belts. See the booster seat instruction manual for directions on how to use the clip or guide. The lap belt lies low and snug across your child's upper thighs. The shoulder belt crosses the middle of your child's chest and shoulder and is off the neck. If your booster seat has lower anchors or top-tether attachments, check its manual for installation instructions. What if my car has only lap belts in the back seat? Check to see if shoulder belts can be installed in your vehicle. Use a travel vest (check the manufacturer's instructions about the use of lap belts only and about the use of lap and shoulder belts). Consider buying another car with lap and shoulder belts in the back seat. What is the difference between high-back boosters and backless boosters? Both types of boosters are designed to raise your child so seat belts fit properly, and both will reduce your child's risk of injury in a crash. High-back boosters should be used in vehicles without headrests or with low seat backs. Many seats that look like high-back boosters are actually combination seats. They come with harnesses that can be used for smaller children and, later, removed for older children. Backless boosters are usually less expensive and are easier to move from one vehicle to another. Backless boosters can be used safely in vehicles with headrests and high seat backs. Seat belts are made for adults. Children should stay in a booster seat until adult seat belts fit correctly, typically when children reach about 4 feet 9 inches in height and are 8 through 12 years of age. Most children will not fit in a seat belt alone until 10 to 11 years of age. When children are old enough and large enough to use the vehicle seat belt alone, they should always use lap and shoulder seat belts for the best protection. All children younger than 13 years should ride in the back seat. The shoulder belt lies across the middle of the chest and shoulder, not the neck or throat. The lap belt is low and snug across the upper thighs, not the belly. Your child is tall enough to sit against the vehicle seat back with her knees bent over the edge of the seat without slouching and can comfortably stay in this position throughout the trip. Make sure your child does not tuck the shoulder belt under her arm or behind her back. This leaves the upper body unprotected and adds extra slack to the seat belt system, putting your child at risk of severe injury in a crash or with sudden braking. Never allow anyone to share seatbelts. All passengers must have their own car seats or seat belts. I've seen products that say they can help make the seat belt fit better. Should we get one of these? No, these products should not be used. They may actually interfere with proper seat belt fit by causing the lap belt to ride too high on the stomach or making the shoulder belt too loose. They can even damage the seat belt. This rule applies to car seats too; do not use extra products unless they came with the seat or are specifically approved by the seat manufacturer. These products are not covered by any federal safety standards, and the AAP does not recommend they be used. As long as children are riding in the correct restraint for their size, they should not need to use additional devices. No one seat is the "best" or "safest." The best seat is the one that fits your child's size, is correctly installed, fits well in your vehicle, and is used properly every time you drive. Don't decide by price alone. A higher price does not mean the seat is safer or easier to use. Avoid used seats if you don't know the seat's history. Is too old. Look on the label for the date it was made. Check with the manufacturer to find out how long it recommends using the seat. Has any visible cracks on it. Does not have a label with the date of manufacture and model number. Without these, you cannot check to see if the seat has been recalled. Does not come with instructions. You need them to know how to use the seat. Instructions can be found on manufacturer Web sites or by contacting the manufacturer. Is missing parts. Used car seats often come without important parts. Check with the manufacturer to make sure you can get the right parts. Was recalled. You can find out by calling the manufacturer or contacting the National Highway Traffic Safety Administration (NHTSA) Vehicle Safety Hotline at 888/327-4236. You can also visit the NHTSA Web site. The vehicle could be driven away from the crash. The vehicle door closest to the car seat was not damaged. No one in the vehicle was injured. The airbags did not go off. You can't see any damage to the car seat. If you have specific questions about the car seat, contact the manufacturer. Front airbags are installed in all new cars. When used with seat belts, airbags work well to protect teenagers and adults; however, airbags can be very dangerous to children, particularly those riding in rear-facing seats, and to preschool- and young school–aged children who are not properly restrained. If your vehicle has a front passenger airbag, infants in rear-facing seats must ride in the back seat. Even in a relatively low-speed crash, the airbag can inflate, strike the car seat, and cause serious brain injury and death. Vehicles with no back seat or a back seat that is not made for passengers are not the best choice for traveling with small children; however, the airbag can be turned off in some of these vehicles if the front seat is needed for a child passenger. See your vehicle owner's manual for more information. Side airbags are available in most new cars. Side airbags improve safety for adults in side-impact crashes. Read your vehicle owner's manual for more information about the airbags in your vehicle. Read your car seat instructions and the vehicle owner's manual for guidance on placing the seat next to a side airbag. The car safety seat your child will be using fits properly in the vehicle used for transport. The car safety seat being used is appropriate for the age and size of your child. The person in charge of transporting your child knows how to install and use the car safety seat correctly. All drivers must have a valid driver's license. In some states, school bus drivers need to have a special type of license. Staff to child ratios for transport should meet or exceed those required for the classroom. Every child should be supervised during transport, either by school staff or a parent volunteer, so the driver can focus on driving. School staff, teachers, and drivers should know what to do in an emergency, know how to properly use car safety seats and seat belts, and be aware of other safety requirements. The Federal Aviation Administration (FAA) and the AAP recommend that children less than 40 pounds be securely fastened in certified child restraints when flying. This will help keep them safe during takeoff and landing or in case of turbulence. Most rear-facing, convertible, and forward-facing seats can be used on airplanes, but booster seats and travel vests cannot. Read your seat's instruction manual and look for a label on the car safety seat that says, "This restraint is certified for use in motor vehicles and aircraft." You can also consider using a restraint made only for use on airplanes and approved by the FAA. Larger children may use the airplane seat belt or continue to use their car safety seat on the airplane as long as it is labeled for use on aircraft and the child has not exceeded the seat's weight or height limit. Remember that your child will need an appropriate car safety seat to use at your destination. For more information, visit the FAA Web site or the CARES (Airplane Safety Harness for Children) Web site. National Child Passenger Safety Certification (Click on "Find a Tech" or call 877/366-8154.) – Includes a list of CPSTs fluent in Spanish and other languages or with extra training in the transportation of children with special needs. Be a good role model. Make sure you always wear your seatbelt. 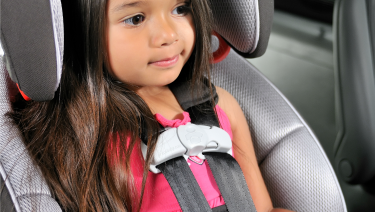 This will help your child form a lifelong habit of buckling up. Make sure that everyone who transports your child uses the correct car seat or seat belt on every trip, every time. Being consistent with car seat use is good parenting, reduces fussing and complaints, and is safest for your child. Die of heat stroke because temperatures can reach deadly levels in minutes. Be strangled by power windows, retracting seat belts, sunroofs, or accessories. Knock the vehicle into gear, setting it into motion. Be backed over when the vehicle backs up. Become trapped in the trunk of the vehicle. Always read and follow the manufacturer's instructions for your car seat. If you do not have those, write or call the company's customer service department. They will ask you for the model number, the name of the seat, and date of manufacture. The manufacturer's address and phone number are on a label on the seat. Also, be sure to follow the instructions in your vehicle owner's manual about using car seats. Some manufacturers' instructions may be available on their Web sites. Remember to fill out and mail in the registration card that comes with the car safety seat. You can also register your seat on the manufacturer's Web site. It will be important in case the seat is recalled. Although the AAP is not a testing or standard-setting organization, this article sets forth the AAP recommendations based on the peer-reviewed literature available at the time of its publication and sets forth some of the factors that parents should consider before selecting and using a car seat. Latch image adapted from National Highway Traffic Safety Administration. LATCH Makes Child Safety Seat Installation as Easy as 1-2-3. DOT HS publication 809 489. Published March 2011. https://www.safercar.gov/parents/CarSeats/pdf-carseat/English/LATCH_Installation.pdf. Accessed January 13, 2017. Figure 1 from Bull MJ, Engle WA; American Academy of Pediatrics Committee on Injury, Violence, and Poison Prevention, Committee on Fetus and Newborn. Safe transportation of preterm and low birth weight infants at hospital discharge. Pediatrics. 2009;123(5);1424–1429.